This is how I rate the 1972 Brora I have tried. Although I gave 1 & 2 96 points the DL edges it for me.I did not include any 1972 G&M Connoisseurs Choice because they are only 40%. This review is from a decent sized sample. 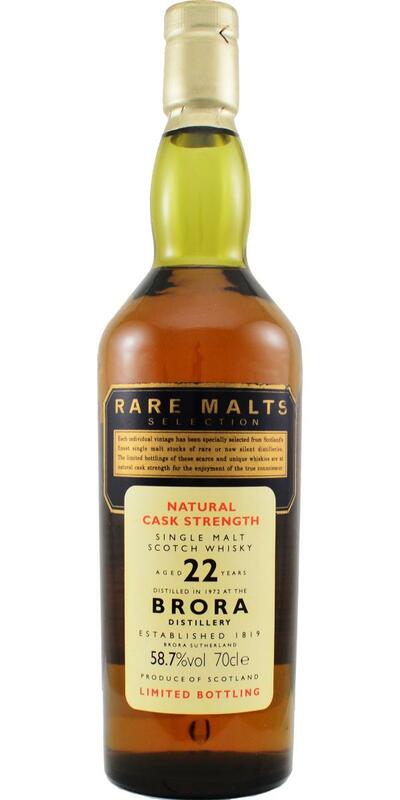 Nose - less expressive, the peat has dissipated leaving sweet caramel and a hint of fresh pineapple? Palate - Much creamier and unlike the nose the peat is huge now, a big surprise that was, similar to the Brorazilla for effect. Finish - Huge, the water has really opened this up. This is what whisky is supposed to be like, in my humble opinion better than any Islay whisky. This is better than the 40 year IB it is still punchy but very elegant. Really lovely, classic Brora I suppose. Sweet, pungent and earthy mixed in with burning wood embers, brine, overcast day on a beach , rock pools, that sort of thing. More sea salt, sweet ripe fruit like plum and nectarine. Some people say there are farmy notes in older Brora but that is not my interpretation of this expression. If cow dung smells like this I would bury my face in it. It is much more pleasant than that (obviously) it is more like wet hay mixed in with burnt orange and caramel mixed in with sweet wood smoke. Early Brora including some of the 30 year OB have the best noses of any whisky, this is right up there, just perfect. Powerful bitter oak mixed in with sweet caramel and faint orange. The sweetness slowly grows over the palate as does the peat and it is peat mixed with so much more and why I have been a fan of this distillery for so long. The peat washes over the tongue but its sweet and restrained, perfect. Long, smooth, warming with the peat mixing with the sweetness beautifully. If you have a bigger mouthful it explodes in your mouth, awesome. Nose: Completely different than the Special Release! Smoky, peaty and very farmy. Coal, ash, motor oil, hot asphalt, wet hay and tons of peat bales. Wax, tobacco, cigar box, humidor and only subtly-sweet tropical fruit flavors that try to force themselves through from time to time, but are quickly subordinated again. One of the "dirtiest" noses ever - awesome !!! Taste: What a power! Incredibly dark, smoky and "dirty" ... again in the taste again lots of peat, coal smoke, wax and only subtle fruit notes, which are lined with honey and vanilla. A taste that you will not forget !!! Finish: infinitely long loops! The finish reflects the nose and the taste completely - great! An absolutely dark part full of peat and tar flavors. Remark: The aromas stick to your palate for a week ... just awesome! 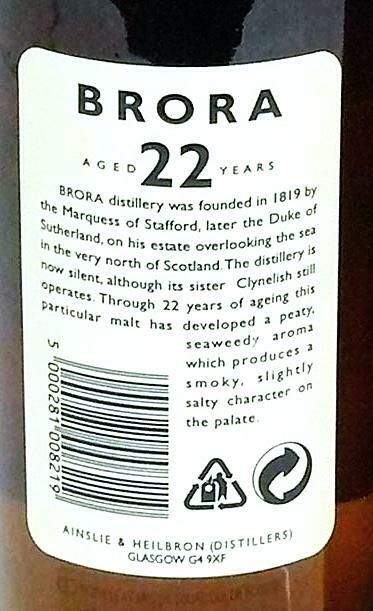 I like Brora very much - especially the smoky and leathery ones. This one is really smoky - almost becoming a bit Ardbegish. N: Sweet, fruity organic cow-dung in the face. This dram will time travel you back to the 1970’s to a farm on a hot summers day with an ice-cream shop next door. Order a light white vanilla ice-cream with passion fruits and bubblegum - a tutti-fruity then! Super fresh and vibrant. T: Husky, oily, mineral peat… then heat <<. Add water for a creamy, milky, viscous body like congealed blood - not that i’d know, or like the mouth residue after eating peanut butter and honey mixed with saliva. Sounds charming i know, but we are talking about chemistry and biology here. Another textural gem of the highest accord. F: The impact is so huge on arrival and development, the finish for me begun with head wagging and dad-noises followed by a stunned awe-inspiring silence and a ‘wow’ at the death. C: You’ll be hard pressed to find a finer whisky, ill get a bottle...oh wait!, £3400? [Oct ’14] - aah maybe not. @Feusi: you are right about Serge's rating for this whisky. 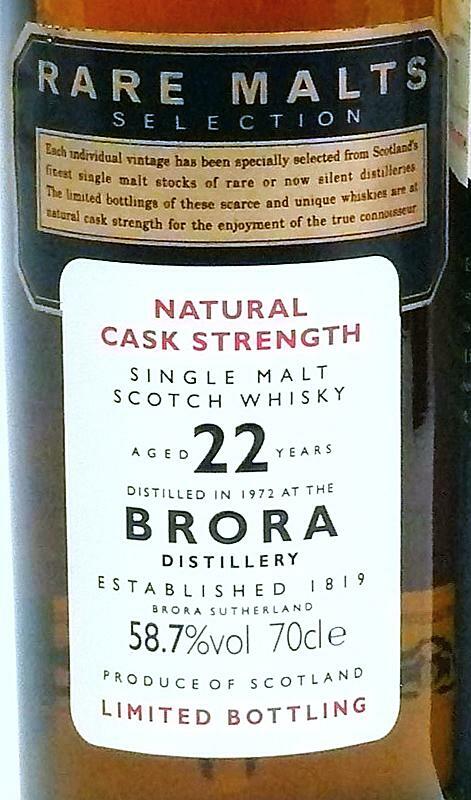 But meanwhile, another 1972 Brora has topped the list of his ratings: the 40yo OB (98 points)!